Clear Vision | Pro Chem, Inc.
CLEAR VISION glass treatment will improve your visibility while driving in the rain, sleet, or snow. It repels rain, causing the water to bead and run off the glass while driving. It also leaves a protective coating that makes removal of tar, frost, ice, salt, mud and bugs easier. Each can contains 4-10 applications, depending on size of windshield. Clear Vision can also be applied to glass shower doors to protect the glass from water scale and buildup, thus decreasing cleaning frequency. 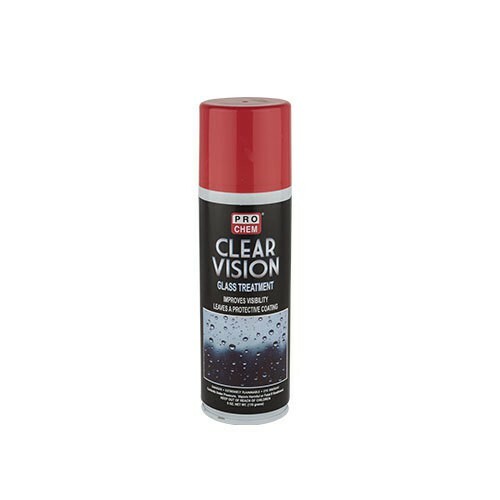 Excellent for use as an anti-fog coating on mirrors. Shake can well and apply light coating on glass and wipe with a dry clean cloth. Buff with microfiber cloth. For rain protection, spray front and back windshields. For frost and snow protection, spray all windows to allow easy removal of frost and snow. Spray on windshield wipers to condition and lengthen life of wipers. Note: This product is for use on glass. It contains acetone and will etch certain plastics. Do not use on headlights. Do not use in interior of vehicle. Do not spray directly on paint.